Our team has years of experience in cabinetry, and they have successfully completed many different kinds of projects. They know what will work, and they can offer you solutions for custom cabinets that will be exactly what you envision. Let us help you turn your ideas into a beautiful reality! The commercial cabinets Tulsa business owners want are high quality and beautiful, two things that don’t happen by chance! Our team completes every job thoroughly and with the same attention to detail no matter how big or small. Our industry is constantly changing and improving. While some things will always stay the same, we recognize the ability to change with the times. A&S Millworks acknowledges new trends and techniques in the industry, and we keep our employees up-to-date on things that can improve our overall customer satisfaction. At A&S Millworks, we try to provide every customer with the highest level of craftsmanship at an incredible value. We do this by always putting the customer first and employing the latest innovations and products in custom cabinetry. It isn’t easy, but it’s what our customers deserve, and it’s what makes us the custom kitchen designers that Tulsa, OK chooses more than any other! Tulsa Millworks – What is it? Millwork is any type of woodwork that comes from a mill. These materials are often seen in homes and businesses. Doors, trim, crown molding, flooring, and paneling are all examples. The variety that can be found in millwork products is what allows A&S Millworks to be able to provide our clients with so many choices for their custom built cabinets. From pine and oak to fir, poplar, hickory, maple and other less common woods, just about any material can be used in millwork. Basic pieces such as flooring and molding are produced in mills, but you can also get quite decorative elements such as crown molding and cabinetry to make your home one-of-a-kind and increase its value. A&S Millworks has been working with this type of product for years, so we know exactly how it should be handled and installed. For example, we will measure and estimate your job accurately so that we order just enough material for your project. Inexperienced millworkers will sometimes underestimate the project in order to save the customer money, but in the end, they have to go back and purchase more. The results of this are that the customer pays more for the job than they were expecting and the product can be inconsistent since it was not milled at the same time. A&S Millworks can offer you the widest range of millwork options in Tulsa, Oklahoma. The custom kitchen Tulsa dreams of is right around the corner! We will also handle your custom closets, custom cabinets, or built-in furniture, all thanks to our skill with countless types and styles of beautiful millwork! Your custom cabinets are more achievable than you think when you choose A&S Millworks because we have the experience and creativity to come up with completely original designs and storage solutions for every home and business. We offer many different finishes for your millwork, including clear sealant, stain, and paint. A clear sealant is the best option if the customer would like to preserve the natural color and texture of the wood. Stain is what we use when the customer would like to match the commercial cabinets Tulsa loves to existing floors, doors, or trim – in other words, their existing millwork. Paint is the most versatile option for custom millwork because there are no limitations on the color our customer can choose. A traditional white always looks crisp and clean, while distressing your cabinets automatically gives them a rustic appearance. You can always go for an non-traditional look with paint as well, opting for an orange, green, or blue for a pop of color in the kitchen. 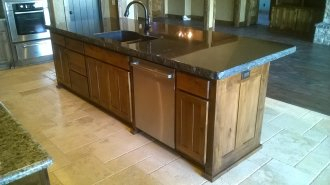 One thing you can be sure of: when you choose us, your cabinets will be custom made for you! They are individually designed and exclusively chosen to meet your exact specifications. Every part of your custom cabinets will be of the highest quality, from the construction of the cabinets themselves to the hinges, mounts, and decorative hardware. Another thing you can trust is that your cabinets will be safe for you and your family. A custom kitchen Tulsa residents can use safely is more important than functionality or beauty any day of the week! We use products that are safe for breathing and food storage. Any time we use strong products in your home, we’ll properly ventilate the area so that you can feel safe knowing that every precaution is taken to protect your loved ones! You’ll also be getting a high-quality product. You’re A&S Millworks custom built cabinets will make your Tulsa home or business look beautiful for years to come. We’re committed to quality. Customers shouldn’t have to follow up on our work with repairs and touch ups a few years down the road, so we do the job right the first time! Finally, expect nothing less than superior customer service from A&S Millworks. Our team works closely with customers to first understand their vision before moving forward. This complete understanding ensures that there are no mistakes or unhappy customers when the job is done. This is just one way that we give our customers our best. In return, we get those customers’ loyalty and their high recommendations! You’ll get all these things, plus value that’s undeniable. If you’re looking for custom kitchen cabinets in Tulsa, OK, choose A&S Millworks for incredible prices and so much more!